How long has it been since you last saw a dentist? Do you have broken implant teeth or artificial teeth that are showing signs of deterioration? If so, then Dr. Larry Picard DDS and his caring, knowledgeable staff can help you to achieve a healthy, bright smile, by providing you with dental implant crowns. Dental implant crowns serve the same purpose as standard crowns, and are made specifically to encase dental implants rather than natural teeth. Treating implants by using dental crowns is a rather simple procedure that can fix a variety of dental issues quickly, and can help to aesthetically improve your teeth and overall oral health. If you’ve been avoiding scheduling an appointment to see a dentist, then please read the information below to find out more about how our trained dental staff can treat your dental concerns with implant crowns. How many office visits does the placement of implant dental crowns usually require? You will usually only need to come into our West Los Angeles dental office twice to complete the implant crown process. At the first visit, the dentist will assess the extent of damage to the tooth and will prepare the tooth for the implant dental crown. An impression of your teeth will be taken, and will be sent to a lab where the implant crown will be created. The dentist will typically put a temporary crown into place while the permanent implant crown is being made. You will be asked to return the office again when the implant crown is finished, and the crown will be cemented into place. In many cases, an implant dental crown is fully or partially covered by your insurance. 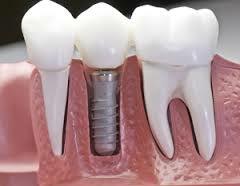 What are some of the benefits of implant dental crowns? An implant tooth that has been weakened from trauma or decay can be quite painful, and can lead to a number of other dental health issues. Implant dental crowns support the tooth, so that associated pain and discomfort can be eliminated, and serves to prevent any further damage to the implant tooth’s structure. Implant dental crowns can also hold dental bridges in place, and can cover discolored implant teeth, as well as those that are not properly shaped. If your smile can benefit from implant dental crowns, call 310-479-4500 or email our West Los Angeles dental offices to schedule your appointment with Dr. Larry Picard DDS. He and his friendly, trained staff can help you to achieve a bright, white smile and improve your oral health.